Why hello there! Do you have countries which you haven't visited yet but just know when you get there you're never going to want to leave?! For me, it's Australia. 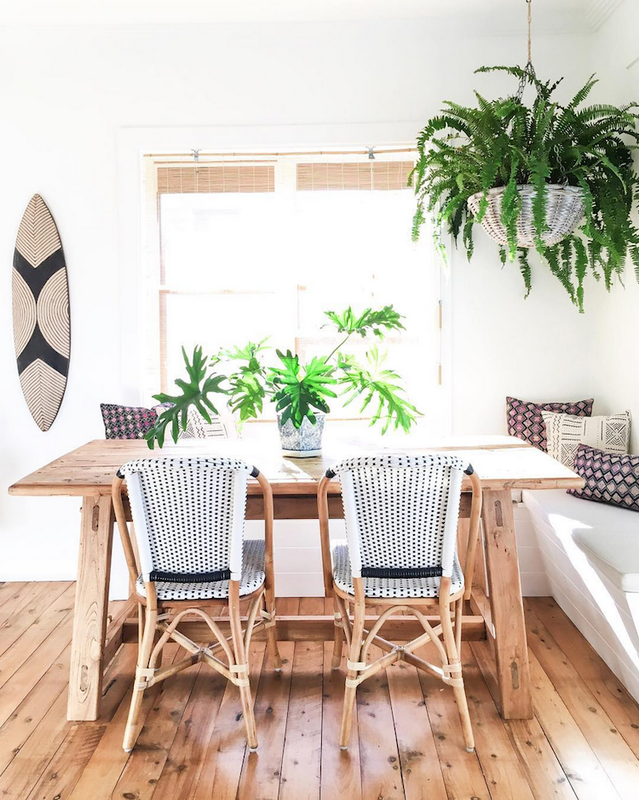 Not only do the inhabitants enjoy a balmy subtropical climate, our Antipodean friends seem to lead a wonderful outdoorsy lifestyle (surfing, beach days and barbies...) and Australian interior design is having a bit of a moment too. 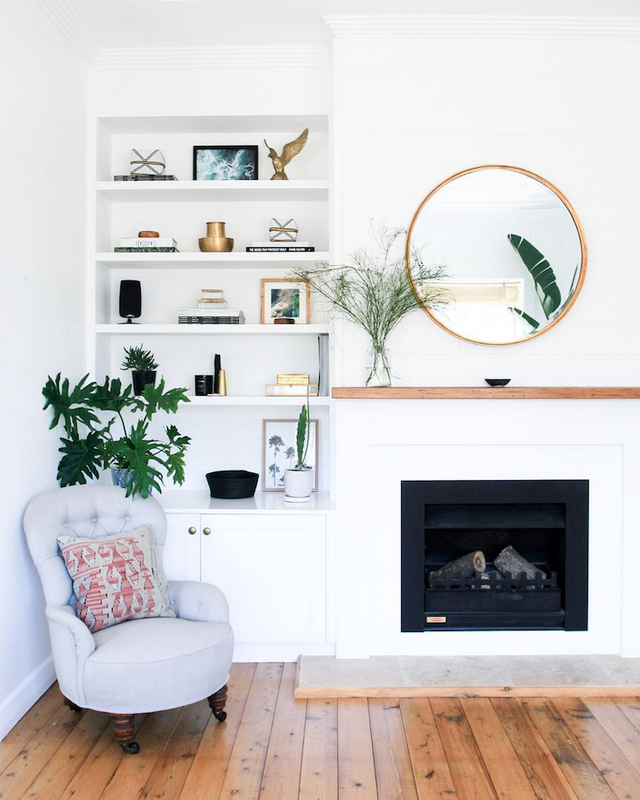 Interior stylist, renovator and fellow Brit, Maddy of Hutchinson.House, made the move four years ago and lives in a beautiful, relaxed beach house with her husband Ben, 10 month old baby girl Florence and cat Pip. 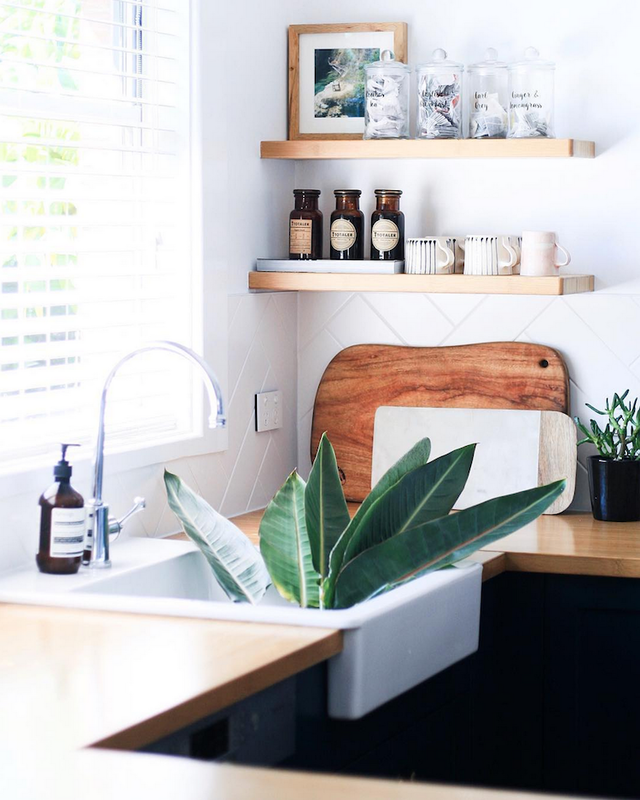 I couldn't resist asking Maddy a little more about their recently renovated home, her take on the latest Australian design trends and their life Down Under. 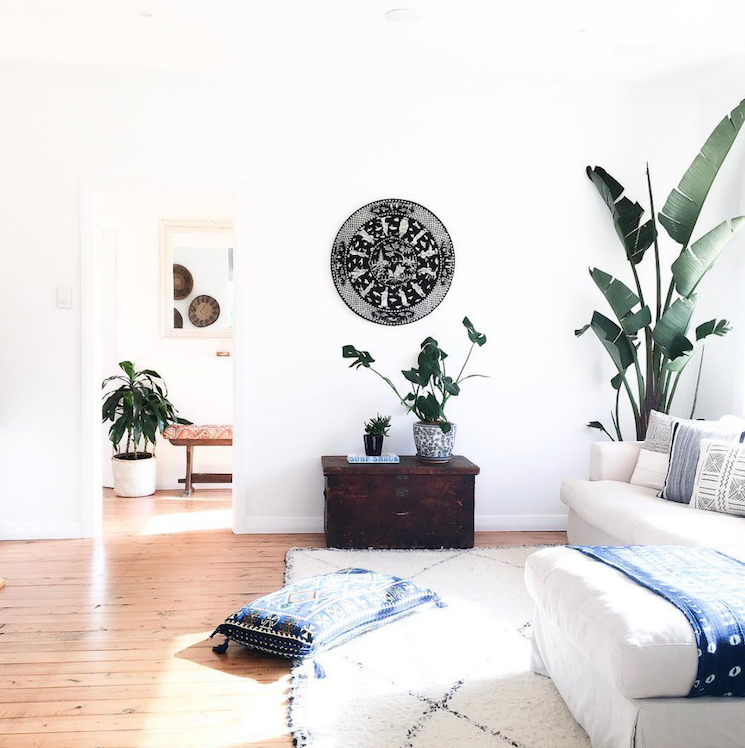 Three African Binga baskets create an interesting wall display and are in keeping with the beachy, natural vibe of the house. I met my husband in the Caribbean when we used to work on yachts. He is Australian and for us to be together, one would have to move... I chose to move to Australia, because well, it's Australia! And he's also a very keen surfer. What do you love most about living Down Under? I love the tropical weather and beach lifestyle. It feels like a permanent holiday! I can well imagine! Your beach home is so lovely! How would you describe your style? Originally from the UK, I will always have an English element within my style and I love a timeless colour scheme like blue and white. Having an overall neutral colour scheme with white walls, earthy materials and fresh greens reflects our informal beach lifestyle. The Miami Dining Chair - Basket Weave is a fairly new addition to the beach house. Sadly it appears to be sold out - but this chair is similar. What do you like most about having a neutral colour scheme? Having a neutral palette is calming and consistent. It gives the flexibility to experiment with patterns and colours throughout the changing seasons and ever changing trends. But more importantly having a neutral palette is easy to strip back to and is timeless and classic. 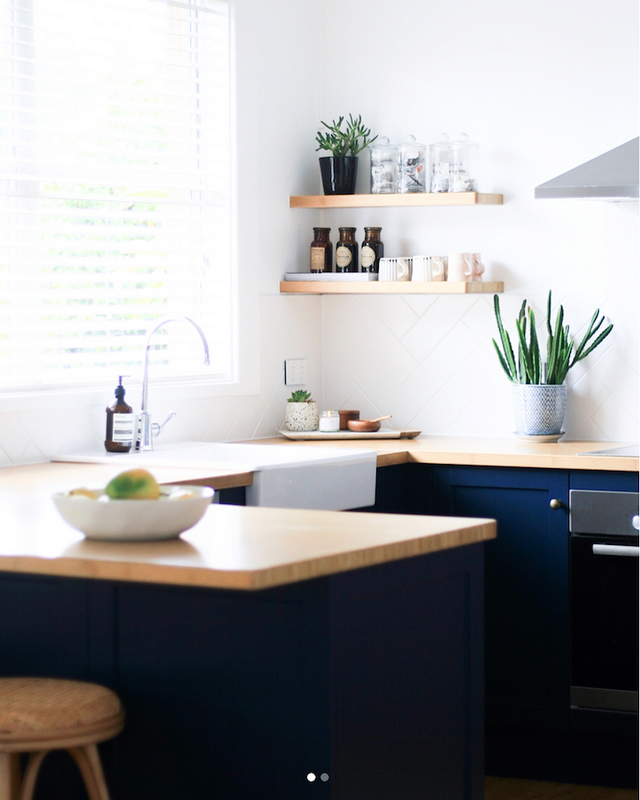 The kitchen doors have been painted in a blue hue from Taubmans. Two cane Eco barstools (love these!) provide a place to sit while the other is cooking. What would you say are the key elements to consider when designing a beach house? The natural light, white walls and using raw materials are key. 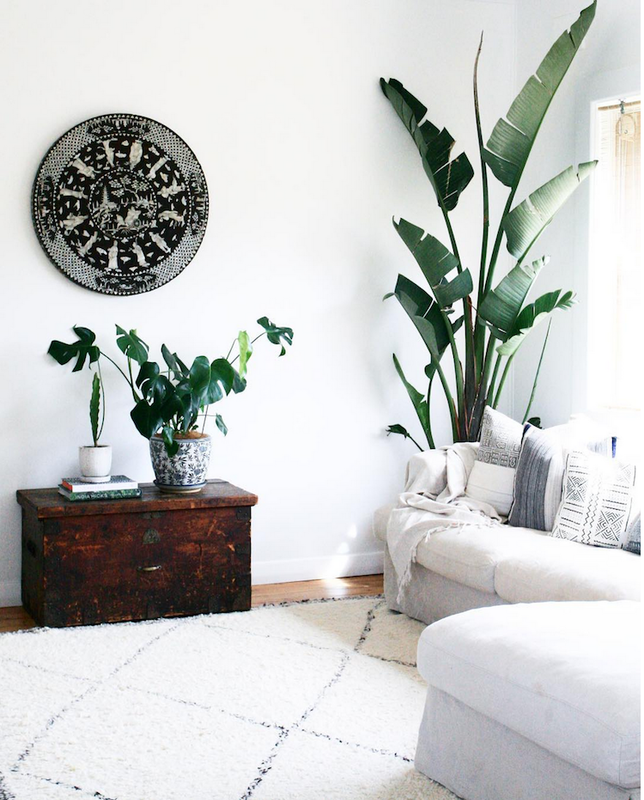 Using tropical plants and greenery is also a simple way to bring the outdoors in and make your space feel fresh and earthy. 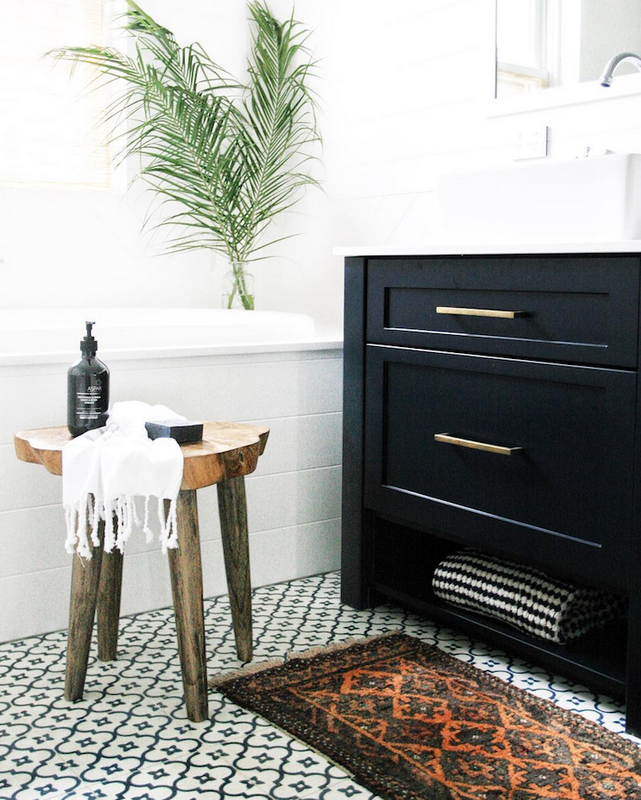 Loom and Field sells a lovely handpicked selection of Beni Ourain Rugs. Where do you buy items for your home? There is a strong global influence throughout our home. 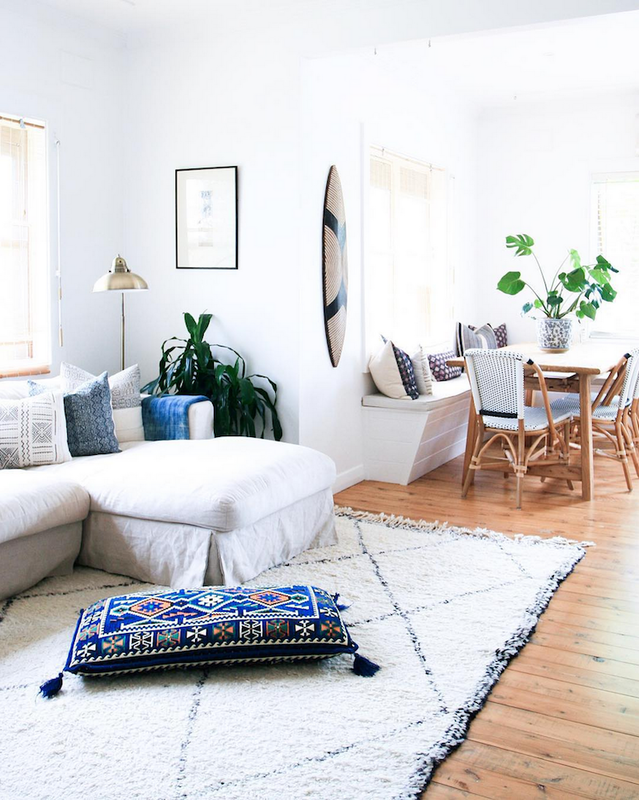 Many pieces we own are unique and derive from places all over the world: from the Moroccan rugs I hand picked in the Atlas mountains to the African Mali mudcloth I chose in a European flea market. "I love artwork, ornaments and textiles that tell a story." Our home is filled with natural light, plants and special pieces that we have collected over time. It reflects us and who we are. Each space in our home shares our story. 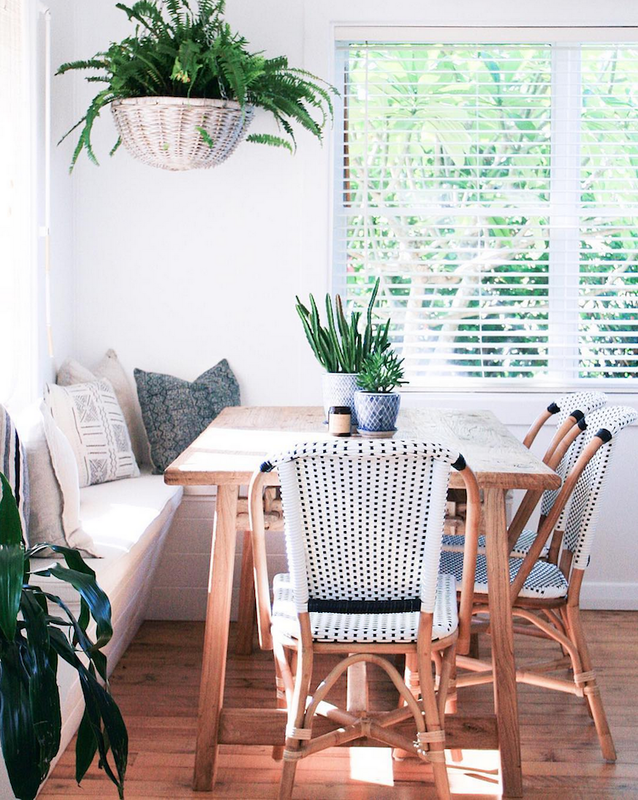 What are the key interior trends in Australia right now? 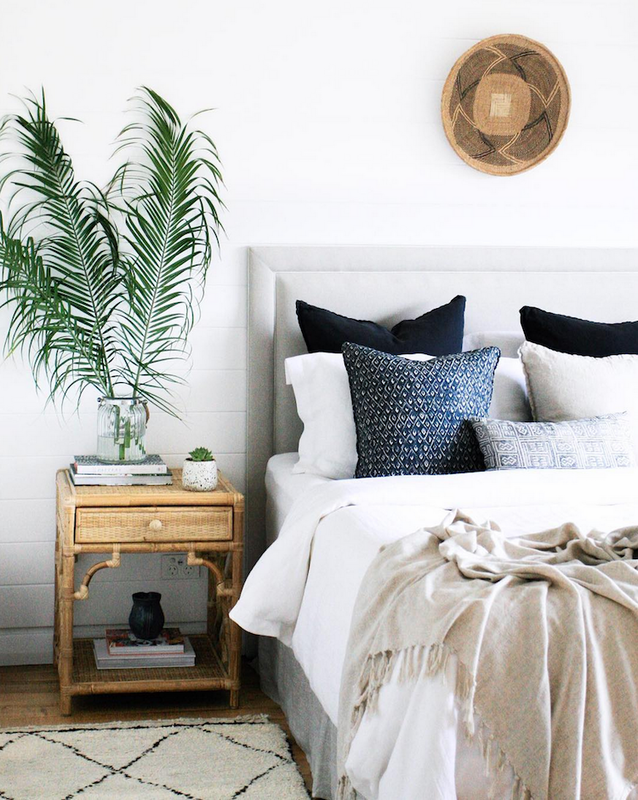 I would say celebrating a neutral colour palette with a minimal boho beach aesthetic. It has become increasingly popular to fill homes with artisanal and bespoke handcrafted goods from around the world. Ethnic and tribal cultures in Africa and Morocco have had a huge influence lately. 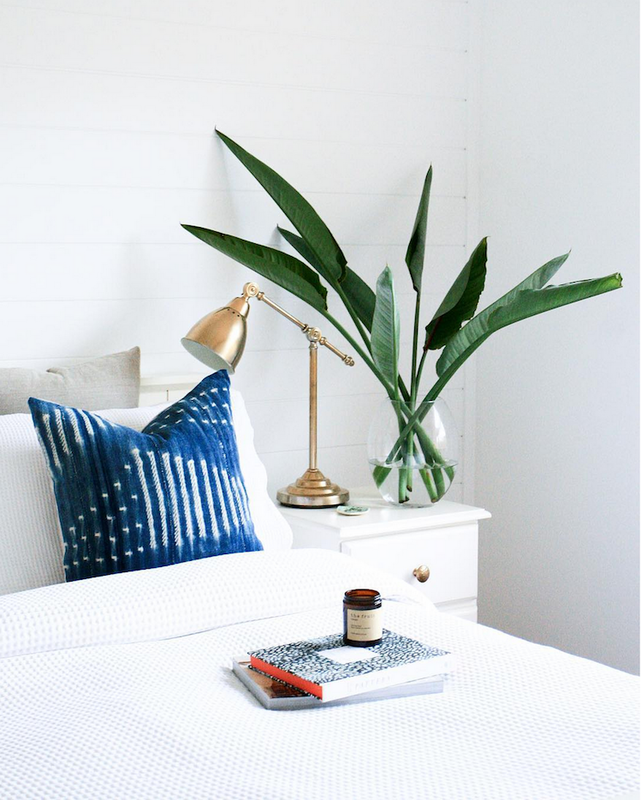 Linen blanket with fringe, Bed headboard from The bedhead Co, blue and white cushion from Indie Bungalow (this batik indigo cushion is similar). African Binga basket (seen on the wall). "Textiles and materials that are ethically sourced and produced are showing more popularity in Australia as we are becoming more sustainable in the way that we live." 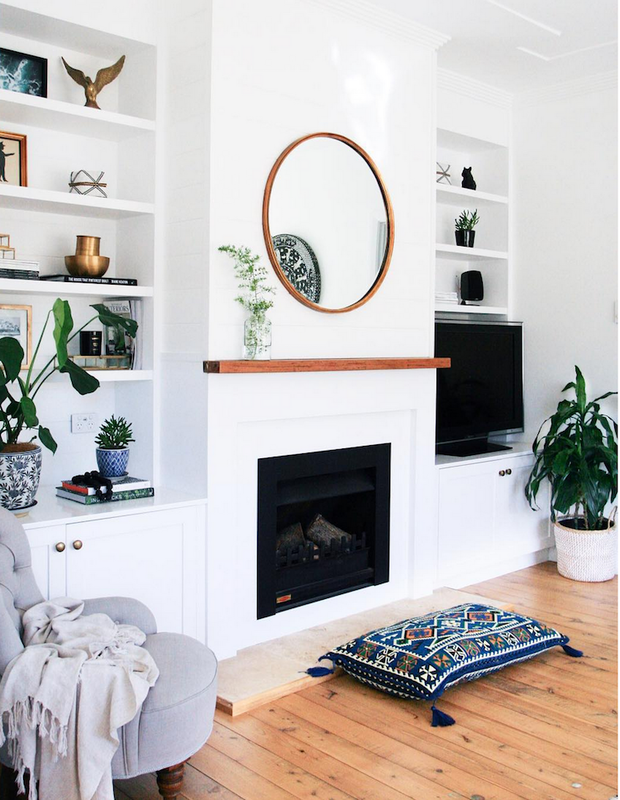 What are your interior trend predictions in Australia for 2018? I sense that interiors will have a stronger European influence with a more dramatic use of colour and pattern. dark walls, wallpaper, burnt reds and terracotta tones will increase. I also feel that an element of Parisian style may make its way into the interior design trend this year. Vanity / bathroom cabinet painted in Benjamin Moore, tiles from Jatana Interiors. 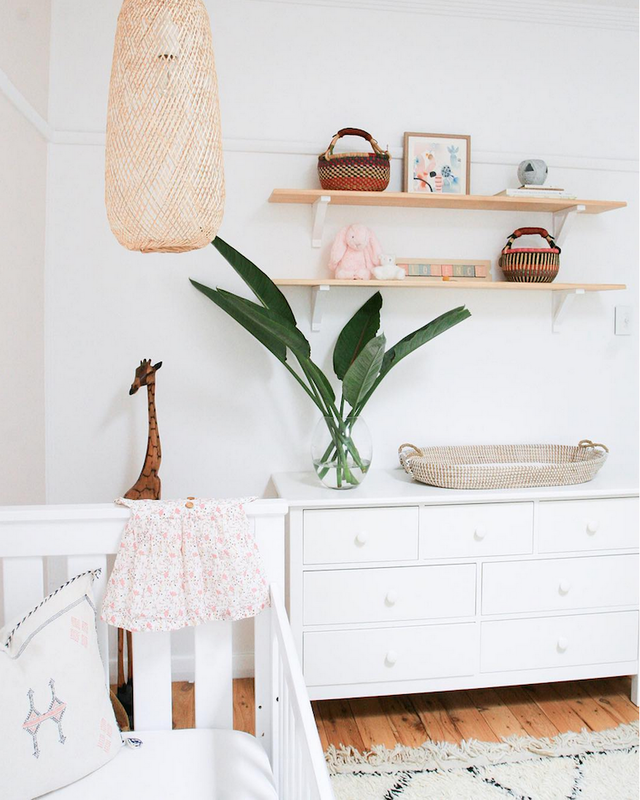 Florence's bedroom has a light dusty pink touch. The neutral scheme, basket pendant light and cushions help to tie the space in with the rest of the home. What a wonderful home? Thank you so much to Maddy for taking the time to show us your beach home and tell us more about your (incredibly enviable) life in Australia! You can see more shots of her lovely home here. Anyone else feeling like a gap year might be in order? 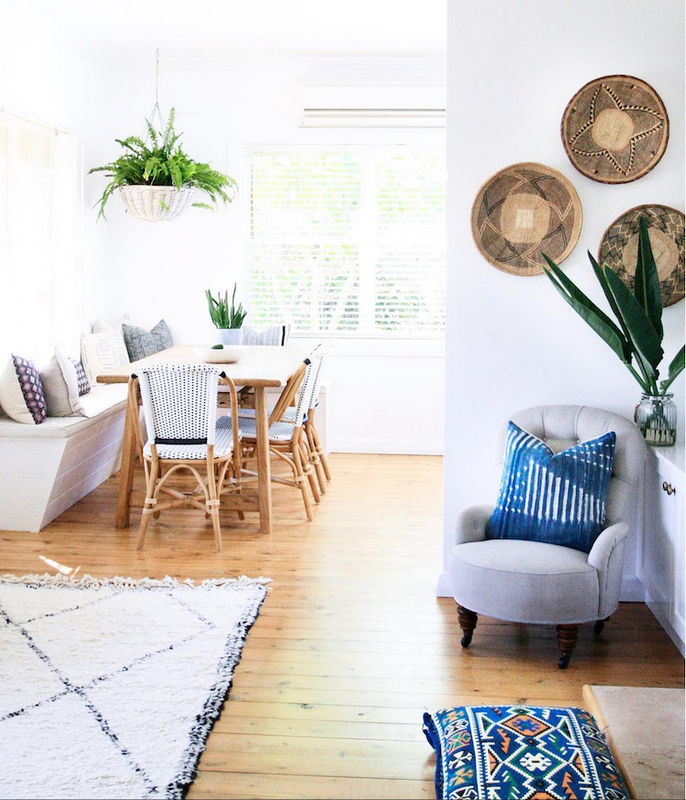 These beautiful, relaxed beach homes might just be the push we all need: a super relaxed cottage, a boho holiday home in Byron Bay (available to rent! ), a holiday home in a former miner's cottage. If a holiday is more likely (they do 17 hour direct flights these days, after all!) - there's also The Bower (if you book it, can I come with you? I promise to be an excellent travel buddy!). The selection of blue textiles is gorgeous! My husband won’t agree to white furniture (One must compromise a little), however this look is lovely. I hope I’m able to cultivate a a similar look with blue textiles on grey and brown furniture. for sharing excellent post. Keep it up. I love the whole vibe of this home! 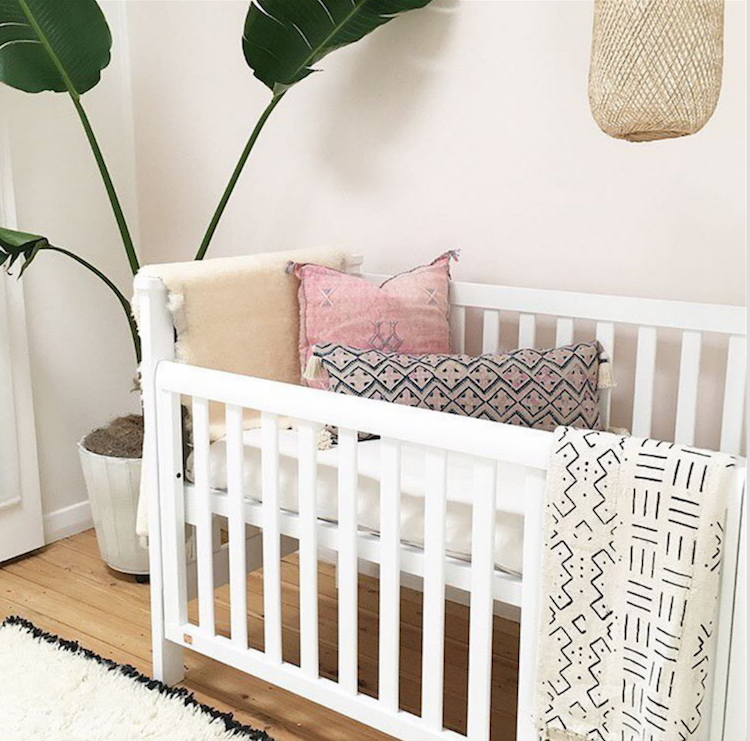 It's bright, breezy and so easy-going with just the right amount of ethnic touches to add personality - very cohesive yet, relaxed just as you described it! So beautiful! Looks very stylish. I like the colours. Think you should also examine the article about literary analysis essay.